In this stair, all the steps are arranged continuously along in one direction. One flight may be split into one or more than one flight by interposing a landing. 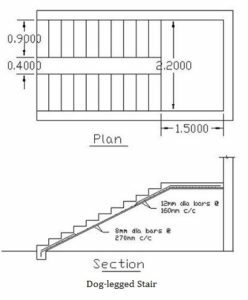 This stair can be used where narrow and long space is available for a staircase such as entrance, porch etc. This stair consists of two straight flights of steps with direct turns between them. This stair is very useful where the total width of the stair is just twice the width of the steps. This type of stair consists of two or more flights arranging a well or opening between the backward and forward flights. When all the steps are difficult to arrange in two flights, a short third flight of 3 to 6 steps may be provided along the direction perpendicular to the hall. 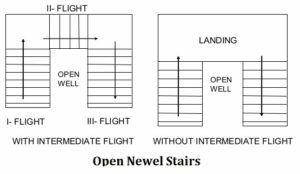 Open newel stair is mostly adopted in the lift. 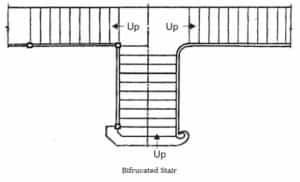 This is another type of open newel stair where the open well between the forward and the backward flight is curved. This stair may contain different geometrical shape. Here the change in direction is achieved by using winders. 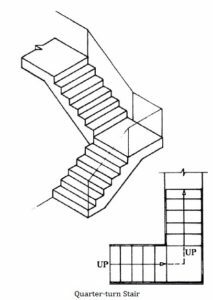 In this type of stair, all the steps radiate from a newel or well hole, in the form of winders. The circular stair is adopted at the back side of a building to access its various floors. 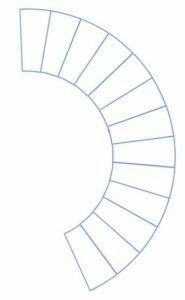 Spiral stair is very similar to a circular stair. It consists of individual steps or treads, connecting to a centre column. 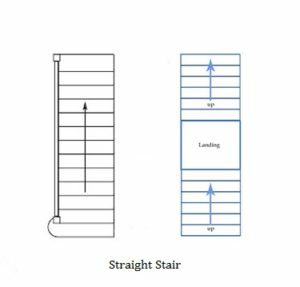 The overall diameter of the stair may range from 1 to 2.5 m.
The quarter-turn stair can be defined as the stairs that are turned at 90 degrees with the help of level landing. This type of stair is provided in modern public buildings as well as residential buildings. 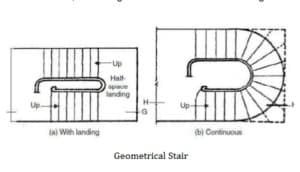 In this stair, the flight is so arranged that there is a wide flight at the start which is sub-divided into narrow flights at the mid-landing. The narrow flights start from either side of the mid landing. Also Read – What Is Sunk Slab? I like design of stairs. 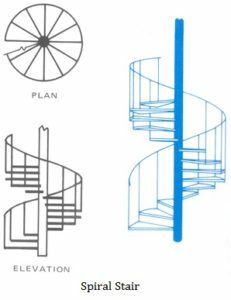 Types of stair design of a like. 22’x24′ Area 02 Storied Bldg.